In a tournament that has already produced a number of shocks, Friday afternoon’s session threw up yet another as 1000/1 shot Ryan Joyce stunned James Wade to reach the World Darts Championship quarter-finals. This result, which came about after the longshot had survived five match darts from Wade, is the latest unexpected result at this year’s dramatic tournament at the Alexandra Palace. 33-year-old Joyce is making his Ally Pally debut having only joined the PDC Tour at the start of the season and missed two match darts at the double eight before Wade blew three shots at the same target to give the rookie a second chance, which this time he took. The Newcastle native has now overcome Anastasia Dobromyslova, Simon Whitlock and Alan Norris, which has seen his outright price cut dramatically to 66/1 with Betway. Elsewhere, Nathan Aspinall produced a 13-dart leg against the throw to bank his place in the quarter-finals following a 4-3 victory over Devon Petersen. Aspinall, who is currently 33/1 in from 300/1 prior to the tournament, will now fancy his chances in the quarter-finals against 40/1 shot Brendan Dolan, who made certain of finishing in the final eight after beating Benito Van de Pas 4-1 a round earlier. 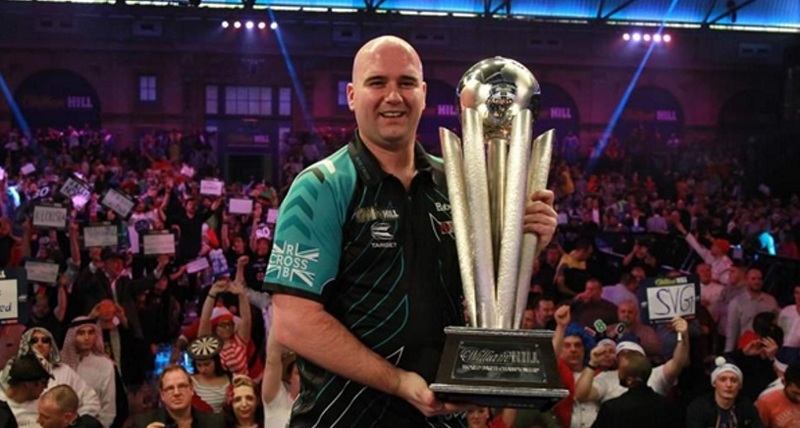 Friday night’s final match saw the end of Rob Cross’ defence of the title he picked up this time last year. Voltage threw away a two-set lead over Luke Humphries, who rallied magnificently to draw level before taking the lead and finishing a 4-2 winner. Humphries, who started the day at 40/1, has now seen his price chipped in with Betway to 20/1. One player who survived a scare is second favourite Gary Anderson, who fought back from 2-0 and 3-2 down to defeat Chris Dobey. The Flying Scotsman had survived a match dart in his previous game against Jermaine Wattimena and needed to cling on once again. In the end, he took three successive legs to claim his first set. After surviving Dobey’s bullseye dart for a fifth leg checkout, Anderson took charge of the game to make the last eight, where he will meet Dave Chisnall after Chizzy beat Jamie Lewis in straight sets on Friday night. Finally, Michael van Gerwen averaged 108 for a 4-1 victory over two times World Champion Adrian Lewis in a match that, despite the one-sided scoreline, would have given Jackpot some hope for the future. Although bettered by the world’s best player, Lewis averaged over 100 and hit 10x 180s in an impressive display in which he also managed to win 10 of the 24 legs played. Michael van Gerwen is the short-priced favourite at 4/5, while second in the betting Gary Anderson is available at 10/3 with Betway. The same online and mobile bookmaker are also offering 5’s on Michael Smith, 7’s on Rob Cross and 25/1 for Dave Chisnall. Raymond van Barneveld’s retirement year took a tricky turn on Monday as the five-time PDC & BDO world champion went out in this year’s second round at the Ally Pally. In losing 3-2 to Darius Labanauskas, Barney has now dropped down to a provisional 26th on the Order of Merit and faces a tough test to make next year’s majors. It’s a sad way for the former number one to professionally bow out, but the Darts World Cup aside — which he won alongside Michael van Gerwen — it’s been a largely miserable year on the circuit for the Dutchman. For Barney to follow in Phil ‘The Power’ Taylor’s footsteps and have a successful send off, the 51-year-old now needs to do well on both the Pro and European tours in the new year. Barney certainly deserves a decent goodbye too, having won four BDO titles at the Lakeside before claiming the PDC version within 18 months of switching codes back in 2006. He went on to win two UK Opens, one Darts Premier League and one Grand Slam of Darts among many other notable victories. Elsewhere, Michael van Gerwen took to the oche wetter than usual after one silly crowd member threw beer all over the world number one during his walkout for his opening match against Alan Tabern. Understandably upset, the Dutchman returned backstage to compose himself before returning to the stage where he beat his English opponent 3-1 in the second round. 29-year-old Mighty Mike is now 11/8 to win outright at Betway. 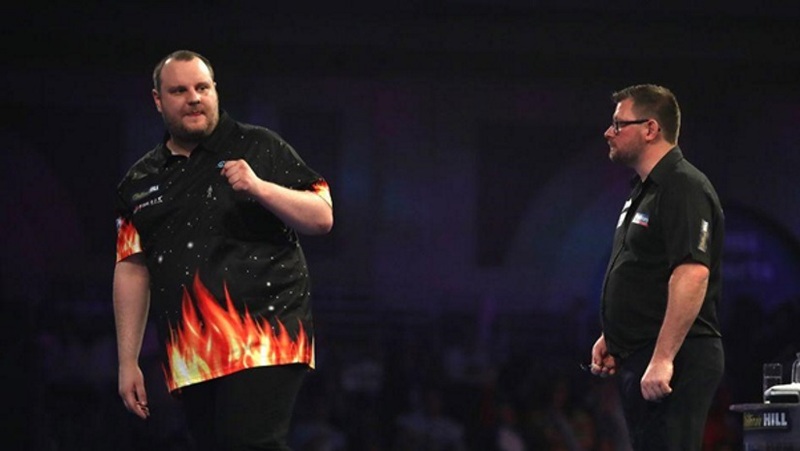 One leading darter who is now out of the betting is Peter ‘Snakebite’ Wright, who was knocked out on Sunday night as Spaniard Toni Alcinas pulled off a surprise 3-1 victory. The world No 3, who was dressed in matching Santa Claus outfit and trademark mohawk, lost the first two sets and never really recovered before being eliminated early from this year’s competition courtesy of a 3-2 defeat. Earlier on, Dave Chisnall fought back from two sets down to beat Josh Payne, while the first-ever female player in the PDC World Championship, Lisa Ashton, went out her first time, losing to Jan Dekker of The Netherlands 3-1. The second ever lady entrant, Russian Anastasia Dobromyslova, didn’t fare any better, herself being shot down by Ryan Joyce in straight sets. World number two, Gary Anderson eased through his first match, winning 3-1 over Kevin Burgess in the second round. This after Burgess ruined Aussie Paul Nicholson’s return from a three-year absence with a 3-0 first round victory. The same scoreline was enough for Daryl Gurney to overcome his second round match against Ross Smith, while reigning champion Rob Cross beat Jeffrey De Zwaan by three sets to one. James Wade came out on top after a five-set clash with Seigo Asada, but the victory was soured by accusations of bullying. The Machine added a bit of needle to the match and admitted afterwards that he “wanted to hurt his opponent in his face” and set out to do just that. Earlier on Wednesday, Michael Smith got his championship up and running with a 3-1 victory over Ron Meulenkamp. Yet to drop a set, Ryan Joyce, fresh from eliminating Anastasia Dobromyslova, whitewashed the eighth seed Simon Whitlock 3-0 as his brilliant debut campaign continued. Joyce is now ranked as 300/1 to win outright at Betway. Tonight, sees Mensur Suljovic and twice winner here Adrian ‘Jackpot’ Lewis kick off their campaigns, while Gerwyn Price gets underway on Friday, all of which has had the following effect on the outright betting for this year’s championships. Gary Anderson remains second favourite as we go into the second week. Betway have placed a 10/3 price on The Flying Scotsman’s head to achieve success here. Following Peter Wright’s elimination, Michael ‘Bully Boy’ Smith moves into third position in the betting, and can now be picked up for 10/1, one point lower than Rob Cross’ 11/1. Mensur Suljovic is available at a generous 18/1, while Gerwyn Price, who gets underway on Friday, is at 20’s. Further down the betting, Daryl Gurney can be backed at 25/1, James Wade 28/1, Adrian Lewis, 50/1 and Dave Chisnall 80/1, all available now at Betway. Christmas means a lot of different things to a lot of different people but for darts’ fans it means only one thing: three weeks of dedicated darts to dig into. Shut the winter weather firmly outside, grab the remote and some cold beers and settle down for one of the greatest tournaments in world sport. That’s right, the biggest ever PDC World Darts Championship gets underway at the Alexandra Palace on December 13 with 96 players battling it out for the Sid Waddell Trophy this year and it’s very much game on for bettors. Let’s have a quick look at the chuckers that could throw you, and them, a fortune this new year. All prices courtesy of the online bookmakers Betway. Michael Van Gerwen and Gary Anderson are the best two players in world darts right now, but there will be no all-star final between the two this year as they will meet in the semi-finals should they win up to that point, which is expected. Even Mighty Mike believes only Anderson can stop him winning a third world title if he finds his best form. The world number one is unsurprisingly the top seed at the Ally Pally for the fifth consecutive year, although he isn’t odds-on this year, but rather the biggest price on offer in years at 11/8. On route to the final, he should be meet either Adrian ‘Jackpot’ Lewis — who has won this event twice before — or fellow Dutchman Raymond van Barneveld, who was crowned PDC world champion in 2007. Van Gerwen regained his World Grand Prix crown in October, and despite enjoying a trophy-laden 2018, has seen his dominance in major events put to the test this year. In fact, this year’s tally of three TV titles is his lowest since 2014. MVG remains the favourite to win a third World Championship crown, but after a difficult few months where he has dropped below his usually impeccable standards, he knows he must improve his game by an extra few percentage points if he is to claim number three. We’ve seen some uncharacteristic performances from the Dutchman recently, missing doubles in bundles, which will need correcting. That said, for any other player, 18 individual titles in a single season would be a great achievement. Van Gerwen will very much still be the man to beat. Gary Anderson is ranked as the fourth seed but is the second favourite in the betting. Anderson is another who has enjoyed a good year, harvesting three televised titles for the first time in his career. With a kind draw, Anderson is scheduled to take on the returning Paul Nicholson if ‘The Asset’ follows through on an expected victory against Kevin Burness in round one on his return to the PDC World Championship after a three-year absence. Anderson should cruise through to the quarter-finals where he could potentially meet 33/1 shot Daryl Gurney before a possible heavyweight battle with MVG in the last four. Many would fancy him in a one-off match right now as Anderson has won three of the last four meetings between the pair. The Flying Scotsman is gambling on a relaxed build-up to the Championship being the catalyst for a successful attempt to win the trophy for the third time and become only the second player after the legendary Phil Taylor to capture more than two world titles. His last win at the Alexandra Palace was back in 2016, while last year he suffered a quarter-final exit to Phil Taylor. Since 2012, he’s always reached the last 16 and has also reached three out of the last four finals. The only reason he isn’t going into the championships as the Grand Slam champion right now is because he let Gerwyn Price get into his head in the final. Lesson learned for Anderson and this should not be a factor going forward. The Scot opted out of the European tour events this year and has spent a relaxing week back home in Scotland, efforts all made with the intention of making a dedicated run at this title and few would back against him. Snakebite has suffered a rather rubbish 2018 but has somehow managed to maintain his place in the world’s top three. Few players make the crowd as happy as Peter Wright, who always brings energy to the oche and he would no doubt be a popular winner, although one with few backers right now. One year ago, he went out at the second round to eventual semi-finalist Jamie Lewis and has not looked himself since, taking only the odd Players Championship event earlier this year, which came before he famously switched his darts. In the draw, Wright couldn’t have asked for a better pathway, one that he should sail through, although with Snakebite there is no such thing as a sure thing. In his quarter of the draw, Ian White, Joe Cullen, Kyle Anderson and Gerwyn Price all await, and Pince aside, there isn’t anyone there who should trouble the world number three too much. If he can get himself on a roll, then he could knock down a few names along the way. However, there is a mental fragility to his game that can leave his unquestionable talent unfulfilled, hence the long price. Smith is a genuine contender at the Ally Pally this year and will rightly fancy his chances of making it past the quarter-final stage for the first time ever. One year ago, Bully Boy made it to the second round in London, where he lost out to Rob Cross in a thriller. This year, he has seemingly passed Cross in ability as his second place finish in the Darts Premier League will testify. Smith is on a collision course to meet Mensur Suljovic in the last 16, with the winner due to face Cross in the quarter-finals, which shouldn’t be of concern to Smith. He has pulled up his doubles average and looks increasingly at home among the bigger names — where he belongs. With a kind draw, 14s is a good each-way bet, especially given that only one from MVG and Anderson can make the final. Voltage is aiming to defend his title in darts’ biggest event, something only eight others have ever achieved since the championship’s inception in 1994. 12 months ago, the former electrician went from winning £7 in pubs to winning the world championship inside of 18 months but admits that such a meteoric rise left him drained. Back then, the largely unknown outsider beat Michael van Gerwen in the semi-finals before ruining Phil ‘The Power’ Taylor’s send off in the final where he clinched the title on his debut. His record here means he goes into this event as the second seed despite suffering a poor year on the circuit. He is, after all, the only player with an unbeaten record at the World Championships. The 28-year-old’s form going into the tournament has not been good enough, looking like a player waiting to be beaten all season. The player has since revealed that an internet troll, displeased at his instant success, had threatened his family, which resulted in Voltage tacking on an extra five stone in weight. He also took the unwise decision to switch darts earlier in the calendar but has since returned to the brand that bought him his success. Cross now claims he is practising like a dream while the weight is largely shed, which will please his backers. Could we see the player from last year? Possibly, but with this being the World Championship, the path to success is filled with potential potholes, even for the second seed. The Gentle has enjoyed a decent 2018 and always remains a good shout as an outsider. This year, Mensur has registered semi-final appearances at the Champions League, World Grand Prix and Grand Slam. The highlight of the Austrian’s year was making the final of the World Matchplay, where he lost a close one to Gary Anderson in a 19-21 defeat. Here at the Ally Pally, however, he has never reached the quarter-finals. Should he do so this year, Michael ‘Bully Boy’ Smith should be lying in wait. Mensur has shown a huge improvement in recent years and most of the year has been in sensational form, looking at home with the top players. Unfortunately, in a demonstration of bad timing, his form of late has dipped. On the plus side, Suljovic received a kind draw, with the bottom half looking wide open, save for the unpredictable Peter Wright. Notoriously hard to play against, Suljovic and his awkward throwing style can easily see off Snakebite on his day, giving The Gentle a fighting chance of reaching the final for the first time ever, making him another great each-way shout. You can pick up 9/1 on The Gentle posting a runner-up finish too. While the favourites enjoy most of the attention, special mention must be made of the retiring Raymond van Barneveld. Barney recently announced that this year’s event would be his last and, as one of the most popular players on the circuit, many would love to see the former world champ collect one last major before making his exit. Like Rob Cross, van Barneveld won the title on his first attempt in 2007. So what’s the price on winning his last? 66/1 with Betway since you ask. Be warned though: while Barney’s still a dangerous opponent, a fairytale finish is, sadly, unlikely. Daryl Gurney says he has addressed his double troubles and is hitting form at the right time ahead of the World Championship. Superchin could meet Gary Anderson in the quarter-finals, in a repeat of this year’s World Grand Prix quarter-final, which Gurney won 3-0. The Northern Irishman has last month scooped his second PDC major when he triumphed at the Players Championship Finals and now believes anything is possible in the wake of his 11-9 victory over Michael van Gerwen. That win over the world’s top player in a major final is an indication that Gurney is primed to take the next step in his career. History dictates that the winner of that event has gone on to win the World Championship in four of the last six years, and Superchin has duly been priced at 33/1 with Betway. Elsewhere, James Wade returned to winning ways last month after a barren four years where he collected consecutive titles at the European Championship and World Series of Darts Finals. This late-season form has landed him a best price of 40/1. Gerwyn ‘Iceman’ Price won his first ever major last month when he beat Gary Anderson in a controversial Grand Slam final and is ranked as 33/1 to continue his success in North London this New Year’s Day.